The Samsung carnival sale is back on with a plethora of products at amazing discounts at Amazon India. From small to large electronic items, including Smartphones, washing machines, refrigerators and air conditioners, the E-commerce giant is offering products at jaw-dropping prices. The sale begun on March 20 and will last till March 24, 2018. One of the major banking sectors, ICICI has joined hands with the online portal, allowing the customers to shop through Amazon offers and avail minimum 10 percent cash back on a selected group of electronic items on paying through credit cards. Amazon hosted a similar sale in the month of February as well. 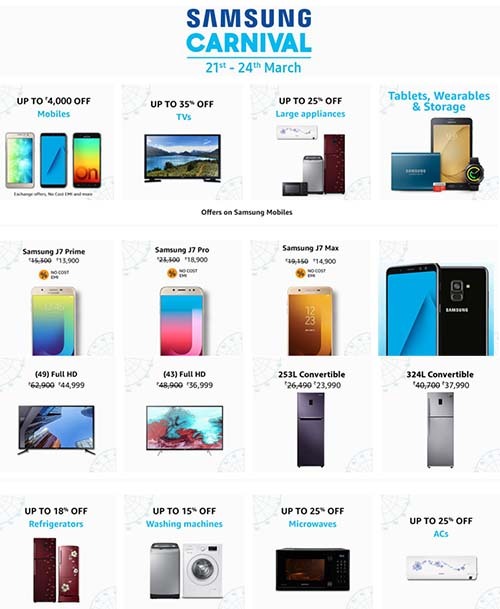 Under the much awaited Samsung carnival sale, a huge discount is available on a range of Samsung Smartphones such as Samsung galaxy On7 prime, Samsung On5 pro Samsung On7 pro, Samsung Galaxy A5, A7 and Galaxy A8+. Some of the best offers that you can find at these products are mentioned on the website. Samsung J5 prime is listed at Rs. 11,900, Samsung J7 prime is at Rs. 13, 900 and Samsung J7 Pro is at Rs. 19,900 and Samsung C7 Pro is at Rs. 24,249. However, if you buy them with your ICICI credit card, all these Smartphones will get a flat off of Rs. 1500. Undoubtedly, all Smartphones are available at discounted prices, but it is the Samsung Galaxy A8 which is certainly a deal you would not like to miss. The original price of the phone is Rs. 41,900 and a flat discount of Rs. 8,910, i.e. almost 21 percent. With such a huge price cut, Samsung Galaxy A8 can be bought at an impressive price of Rs. 32,990. In case, you are planning to exchange your old Smartphone for Samsung Galaxy A8, then you will get an additional discount up to Rs. 17,853. This stylish gadget features a big 6-inch super AMOLED screen with an eye-popping resolution of 2220 * 1080 pixels. Infused with the latest operating system, Android v7 Nougat, this gadget comes with 2.2 GHz + 1.6 GHz Exynos 7885 octa-core processor and a 6GB ram. Coming to its storage capacity, it has an internal storage of 64 GB which can be easily expandable up to 256 GB. With an amazing 3500mAH battery, this Smartphone promises to offer you endless talking, watching movies, chatting and a lot more. Well, you will get a flat discount of Rs. 1500, if you purchase this device via ICICI credit card. There are numerous models of televisions available at a huge price drop. Under the Samsung carnival sale, maximum amount of discount is up to 35 percent. At Amazon, different models of refrigerators, washing machines, and microwaves are available at a maximum discount up to 25 percent. As far as another e-commerce portal is concerned, Flipkart also had the Samsung carnival sale. Products were sold at discounted prices for instance Samsung Galaxy S7 was sold at an unbelievable price of Rs. 22,990. Don’t miss out on this opportunity! Take home latest products at breathtaking prices.